For the American flying Ace of World War I, see David Putnam. For the footballer, see Dave Puttnam. David Terence Puttnam, Baron Puttnam, CBE, HonFRSA, HonFRPS, MRIA (born 25 February 1941) is a British film producer and educator. He sits on the Labour benches in the House of Lords, although he is not principally a politician. In 1976, he set up his own production company, Enigma Productions, through which he produced a string of films, such as The Duellists (Ridley Scott's feature film debut), Chariots of Fire (which won the Academy Award for Best Picture), Local Hero, Memphis Belle, Meeting Venus and The Killing Fields and The Mission with Roland Joffé (which won the Palme d'Or at the Cannes Film Festival in 1986). Many of the Enigma films made in the 1980s were done in association with the financial backer Goldcrest Films. Puttnam was chairman and CEO of Columbia Pictures from June 1986 until September 1987. In 1998, he retired from film production to focus on his work in education and the environment. In 1983, Puttnam was appointed as a Commander of The Most Excellent Order of the British Empire. In 1995 Puttnam was appointed as a Knight Bachelor. In 1997, Puttnam was created as a life peer and was granted Letters Patent to become Baron Puttnam, of Queensgate in the Royal Borough of Kensington and Chelsea. In 1998, Puttnam was named in a list of financial donors to the British Labour Party. In 2002 he chaired the joint scrutiny committee on the Communications Bill, which recommended an amendment to prevent ownership of British terrestrial TV stations by companies with a significant share of the newspaper market. This was widely interpreted as being aimed at stopping Rupert Murdoch's News Corporation from buying channel Five. When the government opposed the amendment, Puttnam brokered a compromise – the introduction of a "public interest" test to be applied by the new regulator Ofcom, but without explicit restrictions. From 2004 to 2005, Puttnam chaired the Hansard Society Commission on the Communication of Parliamentary Democracy, the final report of which urged all political parties to commit to a renewal of parliamentary life in an attempt to reinvigorate representative democracy. In 2007, he chaired the Joint Parliamentary Committee on the Draft Climate Change Bill. Since November 2012, he has been the Prime Ministerial Trade Envoy to Vietnam, Laos, Cambodia and Myanmar (Burma). In December 2012, Puttnam, who lives in Skibbereen, County Cork, was named Ireland’s Digital Champion by Communications Minister Pat Rabbitte, TD. Lord Puttnam on 10 July 2006 at the University of Sunderland School of Computing and Technology Awards Ceremony. In August 2014, Puttnam was one of 200 public figures who were signatories to a letter to The Guardian opposing Scottish independence in the run-up to September's referendum on that issue. Puttnam was for 10 years chairman of the National Film and Television School and taught people such as Nick Park. He founded Skillset, which trains young people to become members of the film and television industries. From 2002-2009 he was UK president of UNICEF and remains an ambassador. Puttnam was the first chancellor of the University of Sunderland from 1997 until 13 July 2007. He was appointed an Honorary Doctor of Education during the School of Education and Lifelong Learning's Academic Awards Ceremonies in his final week as Chancellor and was granted the Freedom of the City of Sunderland upon his retirement. In 1998, he founded the National Teaching Awards and became its first chairman. He was the founding chairman of the General Teaching Council 2000–2002. He was appointed as chancellor of the Open University in 2007. He was also the Chairman of NESTA (The National Endowment for Science, Technology and the Arts) from 1998 until 2003. He was also on the board of directors of learning technologies company Promethean. Lord Puttnam is the patron of SCHOOLS NorthEast, an organisation set up in 2007 to represent all schools in the North East of England. He is also a patron of the Shakespeare Schools Festival, a charity that enables school children across the UK to perform Shakespeare in professional theatres. In May 2014, Puttnam was appointed Chair of the Academic Board for Pearson College, part of Pearson PLC, the first FTSE 100 company to offer degrees in the UK. In March 2015 he was made a freeman at the Metropolitan Borough of Gateshead in recognition of his service as chairman at the Sage Gateshead. He is patron of SCHOOLS NorthEast, an organisation set up in 2007 to promote education and forge relationships between schools in the North East of England. He is also a patron of the Shakespeare Schools Festival, a charity that enables school children across the UK to perform Shakespeare in professional theatres. In 1982, he received the BAFTA Michael Balcon Award for his outstanding contribution to the British Film Industry. In February 2006, he was awarded the BAFTA Fellowship. He made the occasion notable by delivering a particularly moving homage to his late father who had died before he received his Oscar for Chariots of Fire. He also congratulated contemporary filmmakers (specifically George Clooney) for making films with integrity: the lack of such films being produced had been the reason for his retirement from the film industry in the late 1990s. He was awarded The Royal Photographic Society's President's Medal and Honorary Fellowship (HonFRPS) in recognition of a sustained, significant contribution to the art of photography in 2003. In May 2006, he was made an Honorary Fellow of the Royal Society of Arts. On 12 July 2007, he was given the freedom of the City of Sunderland. In 2008, David received an Honorary Degree of Doctor of Science from Nottingham Trent University in recognition of his extraordinary contribution to the cultural landscape of the UK, in both economic and creative terms, and for his notable support for the Nottingham City-based GameCity Festival. He was elected to the Royal Irish Academy in 2015. He is the recipient of 45 honorary degrees from universities in the UK and around the world. He suffers from ME, debilitating him on occasions. In 2009, in partnership with Sir Michael Barber, Puttnam released We Are the People an education documentary featuring high-profile figures discussing their own experiences of education. All in all, his films have won 10 Oscars, 25 BAFTAs and the Palme d'Or at Cannes. Puttnam was deputy Chairman of Channel 4 Television from 2006-2012. He is president of the Film Distributors' Association (FDA) and chair of the TSL Advisory Board. Puttnam co-authored (with Neil Watson) Movies and Money, published in Jan 2000 by Vintage Books. When Puttnam became the chairman of Profero, a London-based digital marketing agency in April 2007, he explained the move saying: "My experience over the past forty-odd (some very odd) years has encompassed marketing, entertainment and social issues, a fascinating mix that is integral to the daily lives of consumers and citizens. A business that can combine and magnify these dynamics can only create incredible value for their clients and, as a by-product, themselves. To me Profero is in just such a position, and it's now my job to help them realise their potential." Puttnam, who had produced Ian Charleson's star-making film Chariots of Fire, contributed a chapter to the 1990 book, For Ian Charleson: A Tribute. On Sunday, 19 August 2007, Puttnam gave the oration at the annual Michael Collins commemoration in Béal na Bláth, County Cork. He has also preached at Durham Cathedral at the feast of the Cathedral's commemoration of its founders and benefactors. Puttnam is patron of the Irish education charity Camara Education and CFS/ME charity Action for ME. Yule, Andrew (1989). Fast Fade: David Puttnam, Columbia Pictures, and the Battle For Hollywood. Delacorte Press. ISBN 0-440-50177-6. 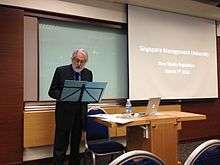 ↑ "Lord David Puttnam: The Lessons of Leveson". Sunderland University. Retrieved 10 April 2013. ↑ "Lord David Puttnam reveals the secrets of the trade". The Jerusalem Post. Retrieved 14 July 2014. ↑ Aljean Harmetz (2 February 1989). "In Re: Columbia Pictures And Puttnam's Orphans". New York Times. Retrieved 28 December 2014. ↑ The London Gazette: (Supplement) no. 49212. p. 9. 30 December 1982. ↑ The London Gazette: (Supplement) no. 53893. p. 2. 30 December 1994. ↑ The London Gazette: no. 54851. p. 8910. 1 August 1997. ↑ "'Luvvies' for Labour". BBC News. 30 August 1998. Retrieved 1 May 2010. ↑ White, Michael (24 May 2005). "Puttnam urges parliament to modernise". The Guardian. London. ↑ "David Cameron: We must push in 'global trade race'". BBC News. 12 November 2012. Retrieved 19 January 2014. ↑ Kennedy, John (17 December 2012). "Oscar-winning producer Lord David Puttnam named Ireland's Digital Champion". siliconrepublic.com. Retrieved 19 January 2014. ↑ "Celebrities' open letter to Scotland – full text and list of signatories". The Guardian. London. 7 August 2014. Retrieved 26 August 2014. ↑ "Lord David Puttnam: UNICEF UK ambassador". unicef.org.uk. Retrieved 19 January 2014. ↑ "David Puttnam-Policy Advisory Council". IPPR. Retrieved 10 April 2013. ↑ "Lord David Puttnam". Open University. Retrieved 10 April 2013. ↑ "Lord Puttnam, Promethean, Senior Independent Director". PrometheanWorld.com. ↑ "Chair of the Academic Board". Pearson College. Retrieved 28 December 2014. ↑ "Brokeback emerges as Bafta winner". BBC News. 19 February 2006. Retrieved 8 October 2006. ↑ "Heriot-Watt University". www1.hw.ac.uk. Retrieved 2016-03-30. ↑ "Freedom of city for film producer". BBC News. 12 July 2007. Retrieved 1 May 2010. ↑ "Lord David Puttnam - Honorary graduates - Your Alumni Association - Alumni - Nottingham Trent University". ntualumni.org.uk. Retrieved 19 January 2014. ↑ "Puttnam tells of 16 years with ME". The Guardian. London. Retrieved 19 January 2014. ↑ "2012–Lord David Puttnam of Queensgate CBE, FRSA". Cardiff University. Retrieved 5 April 2013. ↑ "Lord Puttnam becomes chairman of Profero". MAD. 16 April 2007. Retrieved 13 October 2008. ↑ Ian McKellen, Alan Bates, Hugh Hudson, et al. For Ian Charleson: A Tribute. London: Constable and Company, 1990. pp. 7–11. ↑ "Michael Collins was a peace icon, says Puttnam". The Daily Telegraph. London. Retrieved 25 August 2014. ↑ "Lord Puttnam announced as Patron of Camara Education : Camara". camara.org. Retrieved 19 January 2014. Wikimedia Commons has media related to David Puttnam.